Travel, hike and explore new horizons, while comfortably carrying camera and personal gear with the black magma UltraLight Dual 25L Photo Daypack from MindShift Gear. Clothing, snacks and related items are stored in the top compartment. Underneath, and accessed through a zippered, side panel is a removable, padded compartment with touch-fastening dividers for your DSLR with up to 3 lenses and accessories. Best of all, the zippered camera compartment has handles, a removable shoulder strap and may be used as a chest pack, shoulder bag, or worn at the side with the waist belt. Inside the top compartment is a large sleeve for an up to 15" laptop or 2.5L hydration bladder. And between the two compartments is a trap door platform that may be dropped to create a single storage area. The top lid serves double-duty as a cover and lash point for your jacket or other bulky item. Fully-featured, the UltraLight Dual 25L has an internal zippered mesh pocket for small items, an exterior water bottle pocket, and a front mounting system for a tripod/monopod or trekking poles as well as an attachment loop. Carry the pack with the top handle or wear with the comfortable, padded and breathable harness. Added comfort, airflow, and stability are provided by the adjustable sternum strap, padded waist belt with storage pocket, and cushioned back panel. A versatile pack, the shoulder straps employs daisy chains for attaching gear. Interior and exterior compression straps help prevent unwanted movement and keep the pack nice and tight. For strength, durability and reducing weight the pack is made of lightweight nylon materials. In the event of inclement weather an included seam-sealed rain cover may be quickly deployed from its storage pouch. Zippered lid pocket for quick access to small items. In addition, the lid pocket doubles as a lash point for a large jacket or other bulky items. Box Dimensions (LxWxH) 19.9 x 11.6 x 11.0"
UltraLight Dual 25L Photo Daypack (Black Magma) is rated 4.2 out of 5 by 10. Rated 5 out of 5 by Ryan from Nearly perfect Perfect bag for day hikes, very comfortable and rather spacious. The camera compartment is generously spacious as well, although I would consider using additional dividers or padding to make sure your gear is snug. I am mostly comparing this bag to its similarly sized competitor, LowePro Photo Sport 300 AW II... MindShift is definitely better designed, more mindfully at least. I found this roomier in both upper compartment and camera compartment, more comfortable, and with a slightly larger hydration pack. The traditional padded back is more comfortable than LowePro's ActivZone back as well. One suggestion for MindShift is to add an expandable front pocket to store jackets. The lack of this was the only reason I decided to go with the LowePro and not MindShift. One additional difference is that LowePro's rain jacket conveniently sits at the bottom of the pack, whereas with MindShift you have it in a small pouch that you choose to place somewhere in the bag. Rated 3 out of 5 by LC from Its a bit small I bought this because I didn't want a full pack for gear alone. This was one of the few with a waist strap and space for laptop and upper cavity for personal items. The camera bag is a box that lifts out and can be carried by strap which is handy but I rarely use it. There isn't much space for spare lenses unless they are small. I keep a 24-70 on my nikon body and a squished around that. Anything else has to go up top and risks shakes. The only other option was a huge pack. I wish Mindset made this bag bigger or a mid-size. I am a petit female and most other bags are just huge. I need the waist strap so my shoulders don't have to bear the bulk of the weight. I've had this bag for 1 1/2 years and some of the straps are already coming out of the seams. I have used it plenty but this should not happen. I'm out of the country, so repair isn't really a practical option. Aside from it being cramped, the rain covers have been great inclusions and the side pocket for a compact tripod or water bottle are game changers for me. I don't think I'll ever find my dream bag and I have tried and tried! Maybe I should work with these guys to design one for women. Rated 4 out of 5 by Mountain Ascend from This pack is just what I've been looking for I do a lot of adventure photography and have been playing around with various ways of protecting my gear while also having access for the perfect shots. The Mindgear UltraLight Dual 25L is pretty close to perfect for me. I've only had this for a month now, but have gone on several solid adventures including climbing 14's in CO and slot canyons in Utah. This pack is light, durable and all the small detail Mindshift pup into the design really pays off. The only reason I didn't give this 5 stars if because of the tripod strap. I like how it cleans up when you tuck the straps into their compartments, but I don't like how the weights adjusts when the tripod is strapped in. I think I will use the side pouch and strap to keep it closer to the body (just a personal preference). Rated 4 out of 5 by Robynsr from Nice day hiking pack for photography This is a great daypack for carrying gear while hiking if you like nature photography. I selected it because I am very petite and need a daypack that fits my small frame, but I did sacrifice room for gear. The bottom compartment holds my Nikon dx7200 w a 35 mm lens on it. My other lenses are too big to fit in there but there is plenty of room in the top compartment for more lenses. I would say if you can afford it and are not a small person maybe go for the next size up unless you don't have a lot of gear. This daypack doesn't have the feature where you can get to the camera bag without removing the daypack, although it might be possible if set up creatively. There are straps for tripod and plenty of compartments for accessories and personal items. Comes w a rain cover. If you are on a budget this is a great pick. Rated 5 out of 5 by Anonymous from well thought out, useful features This is a good bag for weight conscious travelers, It holds a basic kit for outdoor, landscape or travel photography. You can pack camera gear and carry on items, The camera compartment slides out for a nice little brakeaway bag. Its within airline specs for carry on and comes with a little rain cover for foul weather. 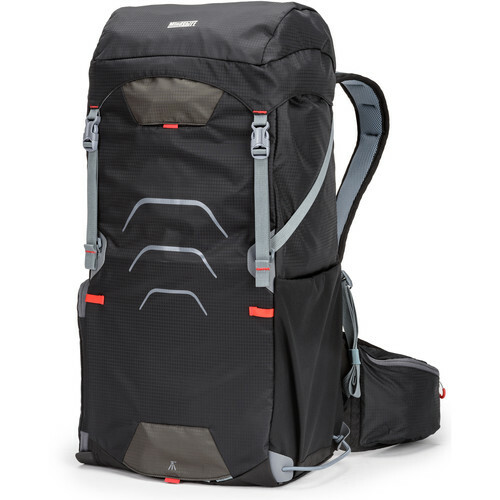 Rated 5 out of 5 by Anonymous from Great for skiing I'm not usually one to write reviews, but figured I should write one about this backpack. I spent quite a bit of time looking at various options on B&H's website before I purchased this. I also visited the store in NYC once I had narrowed my choices down to help make my final decision. The primary purpose for this backpack was to bring my DSLR camera with me skiing. For skiing I generally just stick with one lens so I perhaps could have went with the slightly smaller size that MindShift makes, but I wanted some flexibility to also use this backpack for hiking when I might want to take an extra lens along. I feel that the camera compartment of the bag has adequate padding to protect my camera while skiing even in the event of a fall. It is relatively easy to swing the bag around and access the camera. There are also plenty of other storage compartments to fit all my other skiing accessories (spare pair of goggles, extra layer of clothing, snacks, etc. The bag itself was extremely comfortable to wear while skiing. Overall the bag seems well made and quite sturdy. Am I going to say this bag is perfect? No. I think there are always minor things that can be improved. I'd perhaps like to see a better selection of dividers included for the camera compartment. I also wish the front compartment on the waist strap had a clip to attach my keys to (there's one in the upper back zipper compartment, but it would be a bit more convenient to have my keys in the front compartment). Overall I'm extremely satisfied with this bag though as it met all my needs so far. I used it this entire ski season so have had a decent amount of experience with it before writing this review. Rated 5 out of 5 by Big D from Great Travel Backpack I love this backpack for travel it is the right size for the gear I travel with and is wiithin airline carry-on size. Rated 4 out of 5 by Thomas from This bag is a sleeper hit. The moment I bought this bag, I had buyers remorse. I thought the price tag was a bit on the high side, but I fell in love with it the first day I put it on. The criteria I was looking for: Space for water bottle Side access for camera Tripod holder Laptop pocket Well padded Water resistant The only things I didnt like about this bag are: Left side camera access. (I prefer right) The camera pouch is just one big void. (Easily remedied with foam) The hip straps are a bit cumbersome. The features I loved are: Its so incognito. Does not look like a camera bag. Ultra light. If you have just a few items in this bag, it will feel like you arent even wearing a bag. Camera pouch is removable. Just unzip the left side and pull it right out. There is space for some clothing and personal gear. Overall this bag is a comfortable fit for me as a traveler. Its not a bag that will fit multiple lenses and all your camera gear. This pack will comfortably fit one camera and two lenses inside the removable pouch. There are storage compartments within the bag to keep wires and cables organized. If you have the extra cash this bag is worth it. Would this fit Canon 5D MK III with 16-35 f/2.8L attached plus 24-105 f/4L 'comfortably' without a lot of effort to squeeze in? I have an old lowepro Photo Sport 200 AW which 'doesn't fit comfortably' the above all. Since photo sport is 20L backpack and this one is 25, I am hopeful this will fit and therefore thinking to switch. Can anybody throw some light please? I'd like to carry a Nikon D7200 with L bracket and 70-200 F4 attached and still have room for a 12-24. Will it fit in this bag or do I need to go up a size? Can someone tell me how small the hip belt will tighten? I have small hips and the bag would be useless if I can't cinch the waist belt. It can be tightened to approx 25 -28 . I was wearing shorts and cotton shirt so I didn't want to cinch it down too snug. You'll just have to adjust both ends of the strap. Where is the front mounting system for a tripod? I purchased this bag and cannot find any way to attach a tripod, has anyone succeeded in attaching a tripod to this bag? There are straps in pockets at the top and bottom (indicated with a tripod symbol) that can be used to hold the tripod. there is also a loop at the bottom that I use to attach to the tripod as a back-up in case a strap slips. This system works well enough I think. Hi Tom,The camera compartment is 7.5 x 5 x 8.5 deep so you might be able to fit your full frame camera in depending on which model you have with the 100 macro lens attached. Hope this helps. The description states that this bag has a dedicated tripod, where is it? I cannot find it? It does not have a dedicated tripod - it has dedicated straps (located top and bottom with tripod symbol) and a loop to hold a tripod. How do you access the camera compartment in this bag? Does it have side access? The photos and description aren't clear on this point (unless I missed something) - I'm looking for easy access to my camera while hiking. Yes - it&rsquo;s a side access pocket. I have a notebook measuring 15.1 x 10 x 1.1 . Does it fit in the laptop compartment? Yes I have a 15.6 it fits fine. I'm traveling with it at the moment and its great.